On Saturday, air-quality watchdogs had issued an alert for King County and most of Western Washington, saying smoke was likely to make it unhealthy to be outside. The alert ended Sunday night. Meteorologists are cautiously predicting the smoke that has stubbornly hung around the Seattle area since Friday evening will continue to clear out, as long as rain suppresses wildfires north of the state and winds don’t shift to a northerly direction. The Seattle area awoke Monday morning to clean and damp air, a constrast to Saturday morning’s acrid campfire smell and low-slung haze. Guy said there could be a little smoke aloft early this week but that Sunday’s rain scrubbed our air clean. By Wednesday, another trough is approaching with winds from the west that will bring ocean air and a chance of showers into the region. 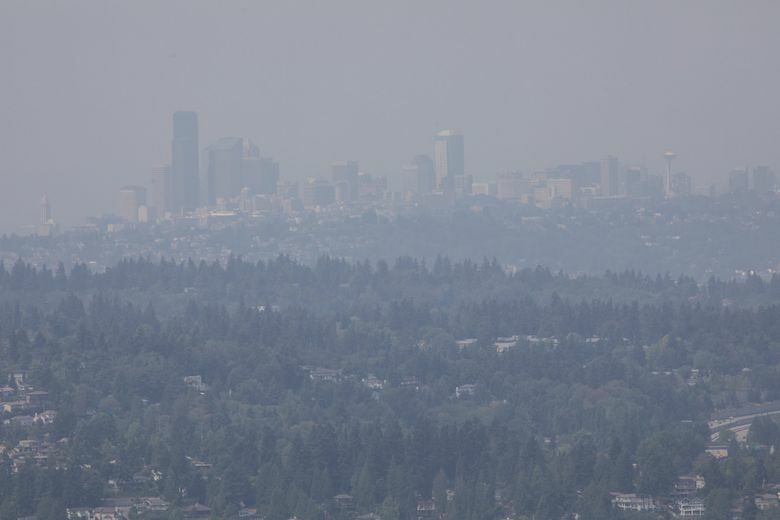 Air-quality watchdogs had issued an alert on Saturday for King County and most of Western Washington, saying smoke was likely to make it unhealthy to be outside at times through Sunday. The alert ended Sunday night. Air quality was moderate by federal standards in the Seattle area as of 11 a.m. on Sunday, according to an index on airnow.gov, a website developed by federal and local agencies. “Good” air quality was found further south of the city. National Weather Service meteorologist Gary Schneider said conditions should continue improving, but warns that shifting winds could push down smoke from fires in British Columbia on Monday. It also depends on how much the rain up north has affected wildfires, he said. Air quality was unhealthy in Seattle on Saturday, and even worse in Central Washington, closer to fires burning in the Cascade Mountains. The cities of Omak, Chelan, Twisp and Winthrop, both in Okanogan County, reported the worst air quality in the country Saturday morning, according to the Environmental Protection Agency’s AirNow.gov. The Seattle area has been blanketed at times in recent weeks by the smoke from wildfires That included a particularly bad stretch that limited visibility and had public agencies asking people to stay indoors. The winds that cleared much of that haze Thursday and Friday were fleeting. Changing weather patterns drew smoke back into central Puget Sound from the Maple fire on the Olympic Peninsula, as well as fires burning on Vancouver Island, B.C. Though the region is no longer choking on thick smoke from blazes in Eastern Washington, the skies likely won’t clear for good until heavy rains hit the Peninsula and B.C., said Jay Albrecht, a meteorologist with the National Weather Service in Seattle. The persistence of the wildfire smoke warrants caution, public-health experts say. While readings at any one time might not appear severe, the cumulative exposure to airborne particulate matter and other pollutants over the last few weeks means it is likely a good idea for all adults to limit their time outside. Staff reporter Daniel Beekman and Asia Fields contributed to this report.